Copy shared emails to inboxes. Sync Read Status of emails. Do not ask users for approval. You can enable the options through the toggle button. 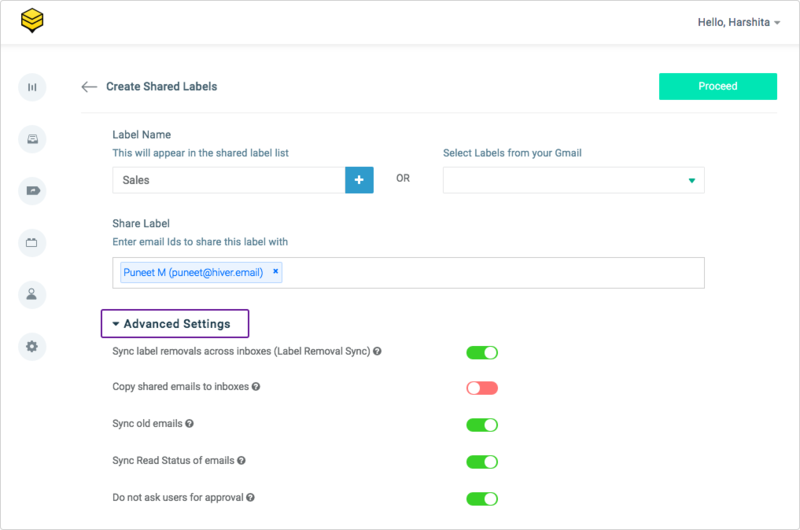 When this option is checked, then whenever any user removes a Shared Label from an email, the same Shared Label is removed from that email from the Mailbox of all the users with whom the email is shared with. With this option switched OFF (default), shared emails are only added to the label that you are sharing, and do not appear in the Gmail Inbox. If you switch this ON, shared emails would also start appearing in the Inbox (along with being added to the label). With this option switched ON (default), emails that already had this label before it was set up as a Shared Label in Hiver will be synced between the Gmail accounts of the users added to the Shared Label. Switch this OFF if you don’t want to sync old emails. This option will synchronize the "Read" status of the email with all the users with whom the email is shared with. This option comes disabled by default. You can enable it while creating the Shared Label. 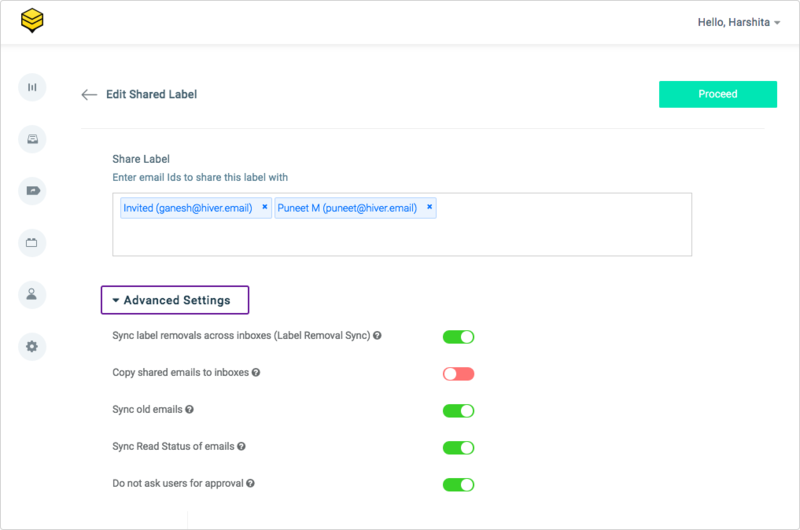 When a new user is added to a Shared Label, all the existing emails under that Shared Label will get synced with that new user with a "Read" status. With this option switched ON (default), users are not asked for permission when labels are shared with them. They’re just sent an email informing about the new shared label. Hiver Admins can specify the following options for Shared Labels for all the users on the Hiver account. Enabling this option will synchronize the 'Read' status of the email with all the users it is shared with. Enabling this option will share all the sub-labels automatically. You wouldn't need to manually share the sub-labels. Click on the 'Features' tab to find the list of options that you can set for the Shared Labels for all the users on the Hiver account.